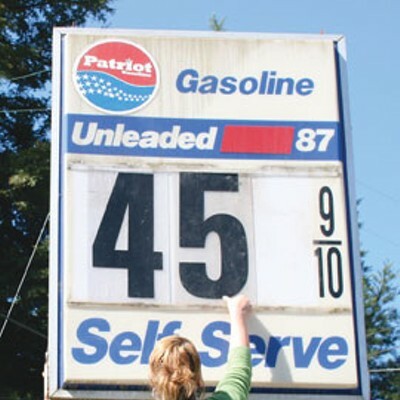 Last Wednesday Shelly O'Brien climbed up a rickety old ladder in front of her one-pump, two-nozzle gas station on Myrtle Avenue in Eureka and raised the price of regular unleaded 14 cents to $4.52 per gallon. "Maybe one of these days I'll be rich enough I can buy myself a new ladder," O'Brien joked on her way down. Then, after chewing on the thought for a moment, she said, "Probably not anytime soon." Switching out the scratched number plates is becoming an all-too frequent occurrence at Indianola Market. 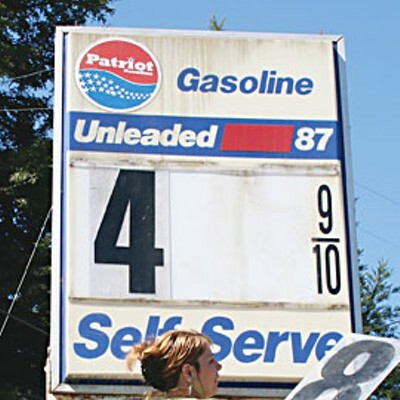 With the nation's skyrocketing gas prices, businesses in general and Humboldt's in particular — where gas prices are often among the country's highest — are feeling the crunch. O'Brien tells me that there's no profit in gas anymore. She continues to run her pump anyway to draw customers into her shop to buy one of her famous hot dogs. But even the hot dogs are more expensive now. She pays an extra $6 in surcharges to cover the transportation costs from Oregon. Back behind the counter inside the store, O'Brien checks Yahoo! 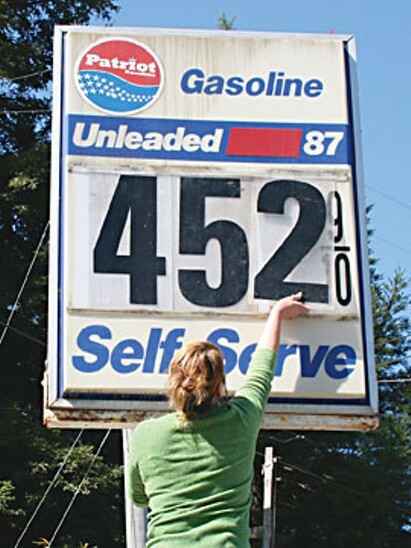 Finance on her laptop regularly for changes in the oil market, and she says she calls Renner Petroleum — the local company that supplies her with gasoline — at least three times a day for price updates. But gas station owners aren't the only people suffering: Local ranchers, farmers, manufacturers, ambulance companies, county government and schools are also trying to figure out ways to cope with the rising price of fuel. Even companies like Renner Petroleum, which supplies O'Brien with gasoline, say they aren't profiting from their increasingly lucrative product. The profits are all going back to oil producers. The middlemen — the Bay Area refineries and the local distributors — end up having to absorb the price hikes, company president Mike Renner told the Journal recently. The effect of high gas prices on his company's profit margins is compounded by the fact that local fuel consumption is down 12-14 percent, Renner said. "The era of easy oil is over," he lamented. In the future, family-run companies like his will have to change to meet the times. 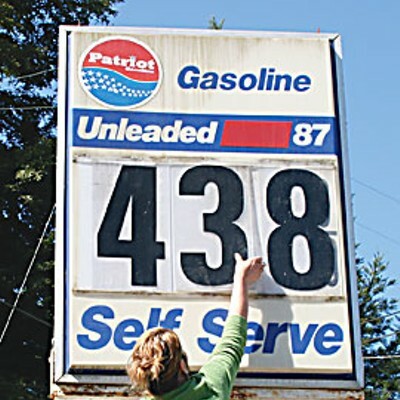 A call for change seems to be a common reaction to rising gas prices. Doug Fini, who manages Humboldt County's motor pool, is hoping to add at least 12 more hybrid vehicles to the county's fleet next year, with 11 already on the road. That's because Fini expects the county's fuel budget — for its 350 vehicles — to be a whopping $300,000 over budget come July. School districts are faced with a similar problem because of their fleet of gas-guzzling school buses. Dan Pires, Director of Transportation for Eureka City Schools, said last week that he expects to be $15,000 over budget this year. That's how much it costs to keep a school library open four hours a day for an entire school year, Pires said. In the short term the district's strategy will be to reduce busing and in the long term to update its fleet. Older school buses on the road now get about 3 miles per gallon, he said. The newer high-tech diesel buses get about 8 mpg. It isn't a panacea, but it will help reduce costs. And, "it's not all bad," he pointed out — with fewer buses, more students will end up walking to school. 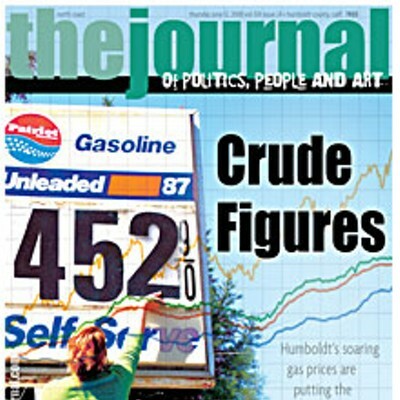 Over at the Humboldt Transit Authority rising fuel prices are a mixed blessing. Even though HTA will be about $120,000 over budget this year, "business is booming," according to General Manager Neleen Fregoso. HTA has seen an increase in ridership — about 700 more rides per month since the same time last year, not including HSU students using the Jackpass — and they've expanded bus service. Fregoso hopes that the Board of Supervisors will agree to a 50 cent price increase for cash fares to cover rising fuel costs. If that's passed, Fregoso says it will go into effect some time this August. Purveyors of alternative fuel — like Andy Cooper at Footprint Recycling in Arcata — are faring the fuel price increase better than most. When reached recently at his biodiesel filling station, business was hopping. Footprint has gotten 15 new members since May. That brings their total membership up to 588 — 100-150 of those joined after the January fuel price spike, Cooper said. He's added 4,000 gallons to monthly production. And his hours for processing biodiesel from restaurant grease have increased to seven days a week. Ironically, he's had to shorten his operating hours to prevent the station from selling out too soon. 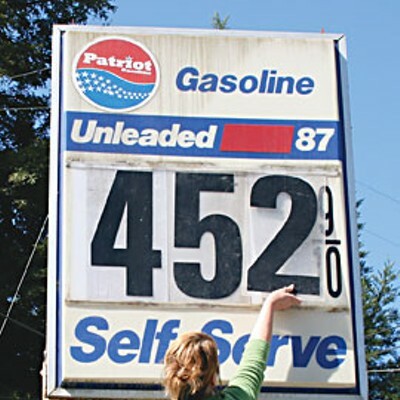 In April 2005, when the Journalfirst wrote about Footprint, their biodiesel was selling for $3.50 per gallon, a dollar over conventional diesel; now the price of the two is about equal. At one point this year Footprint's biofuel was even cheaper than regular diesel. Cooper says they had record sales that day, but it wasn't sustainable. "We're forced to raise the prices to take the pressure off," he said. "When the price of diesel is jumping through the moon it puts an added pressure on our already finite resources." Cooper describes the situation as a catch-22. It's good for his bottom line, but it means that older members are having to pay for greater demand. And whereas before, buying biodiesel was a conscious decision on the part of the consumer, based primarily on environmental considerations, now it's much less so since diesel and biofuel aren't all that different in price. Over at Arcata-Mad River Ambulance Service Inc., owner Doug Boileau said recently that his gas bill is up $20,000 over last year. Boileau's company provides ambulances for Mad River Community Hospital, which is also being hit hard with additional surtaxes and charges from all of the deliveries it receives, according to hospital spokesperson Tom Ayotte. Although, as of yet, those extra costs haven't trickled down to the patient, he said. Boileau is trying hard not to let rising fuel prices affect patients too. He says there are no plans to reduce the number of ambulances out on the road, but he is trying to reduce any unnecessary driving. That may mean that when an ambulance leaves Arcata, the company's second ambulance stationed in McKinleyville won't be driven down to cover for it, which is what happens now. Other transport companies predict changes as well. City Ambulance of Eureka Inc., which operates City Cab, plans to implement a one-dollar surcharge per ride for their taxis soon. And in the long term they're looking into investing in more fuel-efficient cars, according to Director of Operations Jason Chand. With everyone focused so keenly on fuel efficiency, some local car dealerships aren't doing as badly as you might expect. Travis Harper of Harper Motors in Eureka says that business is about the same now as it was this time last year. In fact, he even saw a spike in sales last month. Of course consumers weren't putting down payments on big trucks. "The people who thought it was cool to buy a big truck won't do it anymore," he said from his office last week. Instead, buyers are in the market for smaller vehicles like the Ford Focus and the Kia Rio. For fisherman Mike Zamboni gas prices have made a significant dent in his business. His monthly gas bill, which used to be about $600 for his boat, now costs him around $1,100. And that means that he goes out less and catches fewer fish. It also means that he's getting less for his fish and crabs at market because he says the consumer is less willing to buy crab when he needs to pay for gas instead. If the price keeps rising (fishermen in Europe recently went on strike in light of the even steeper gas prices there) he says, "It won't be worth it to go [fishing] anymore." Steve O'Meara, owner of Kokatat Watersports Wear in Arcata, says that rising fuel prices have been a double hit for his company. Not only are shipping costs increasing but the nylon (derived from petrochemicals) that Kokatat uses for its dry suits has gone up in price by 5-6 percent. "You can't pass 100 percent of that along [to the consumer] right now," O'Meara said. But the rising price of oil globally is not all bad news for Kokatat. It has contributed to the devaluation of the dollar, which means that the company's European accounts are expanding, according to O'Meara. Still, he says Kokatat will definitely be raising its prices next year, which will put pressure on sales and means the company will "lose the [customers] on the cusp." Back at the Indianola Market, Shelly O'Brien is dealing with an unexpected consequence of the gas hike — her old-fashioned gas pump can't be set higher than $3.99 per gallon. So she's charging by the half gallon instead. There are three signs tacked to the pump that explain the situation. Nonetheless, it's hard for some customers to wrap their head around the concept. "People just don't get it," she said last week over the phone, sounding extremely exasperated. But even with fuel prices through the roof, O'Brien says she doesn't have plans to get out of the gasoline business. "I've been through this several times before — not ever to this extreme," she said. "At some point it has to give." Got a gas hell horror story? Share it on our website — www.northcoastjournal.com.